Fifty years have passed since Prince Karim Aga Khan created the Costa Smeralda, making this stretch of the coast of Sardinia, the hot spot for celebrities and the elite. To celebrate the anniversary Hublot has presented at a gala two new limited edition watches dedicated to her. The party held at the Starwood Hotel Cala di Volpe on July 16, with Elton John, who Gave a special performance for the guests, was Also an opportunity to present the Big Bang Costa Smeralda, the model for women, and the Costa Smeralda King Power, men’s model. Watches precious, limited edition of one hundred copies, to celebrate one of the enchanting places of the peninsula. The Costa Smeralda remains among the most loved by the international jet set from the sixties filled the creeks, premises, hotels and golf courses have made this that part of Sardinia among the most loved around the world. Created by Prince Karim Aga Khan in 1994 was later Acquired by the Sheraton hotel chain, then merged into Starwood. In 2003 she was Recognized by the Lebanese-born U.S. billionaire Tom Barrack, A Few months ago When The Emir of Qatar Hamad bin Kalifa to -Thani, the richest in the world, through the sovereign wealth fund Qatar Holding, has Acquired the Emerald Holding. The change of ownership has never scratched the glamor and beauty of the Costa Smeralda Is that after fifty years at the top. Hublot for this, as on other occasions, wanted to celebrate a special anniversary with a party and the launch of two watches inspired her, gold and diamonds, Each produced in a limited edition of only one hundred copies each. The Big Bang model for women Costa Smeralda presents the case 41mm in 18 carat red gold polished and satin finished, bezel with removable gold embellished with red 319 white diamonds for a total of 1:49 carats. Sapphire, the bottom is red and gold has a glass personalized with the logo of the Marina of Porto Cervo in red gold with white rubber inserts in the crown and buttons with white rubber strap and alligator. The men’s model King Power Emerald Coast sees the use of red gold: cash 48 mm in 18 carat red gold satin, the other elements are made in the precious material, the bezel, the crown and buttons That Also have white rubber inserts. 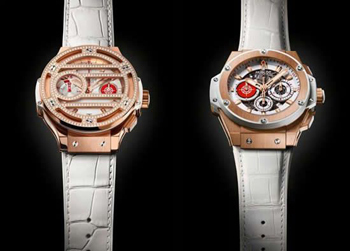 Two watches that celebrated the beauty of the Costa Smeralda and the spirit of summer signed Hublot.